Very dark brown in color and roughly an inch in length. Adult males' wings reach about three-quarters down their abdomens, but they cannot fly. Adult females have only small wing pads. 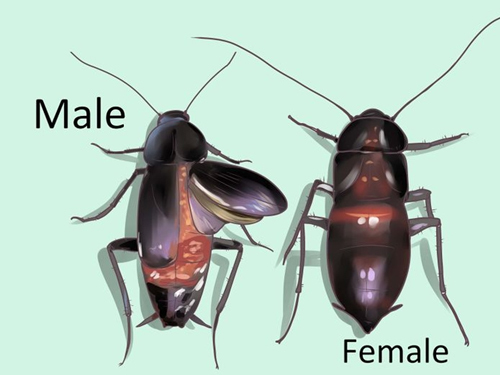 Oriental cockroaches tend to live outdoors when the weather is warm, but they readily move inside during extremes of heat, cold, or drought. They can commonly be found in garbage storage areas, basements, and under porches and decks. They're often found along sill plates in unfinished basements and crawl spaces. The oriental cockroach tends to travel somewhat more slowly than other species. They are often called "waterbugs" since they prefer dark, moist places. They can often be found around decaying organic matter, and in sewers, drains, damp basements, porches, and other damp locations. They can be found outside in bushes, under leaf groundcover, under mulch, and around other damp places outdoors. Females produce an average of 8 egg Capsules, containing 16 eggs in each,from spring to mid-summer. 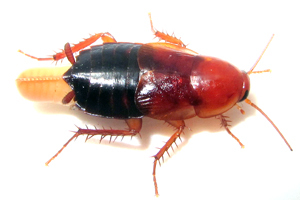 Unlike other urban cockroaches, the Oriental roach produces only one generation per year where temperatures are cool in winter. The female will carry the egg capsule(irregularly shaped,black,3/8" long,and 1/4"wide), for around 30 hours and then drops or attaches it in a protected area, near a food supply. The eggs hatch in about 60 days under warm conditions. At least 75% of the eggs must hatch to open the capsule. The young become adults in 6-12 months. Nymphs (young) are active from about March through much of the summer. During this period they molt seven to ten times, and are reddish-brown to black in color, except in the first stage when they are pale tan. The older brown. Oriental cockroach nymphs are very difficult to distinguish from the American cockroach nymphs. This type of roach will have seasonal cycle in it's development. They peak to adults during the spring and early summer, dwindling in numbers by the late summer/early fall. Nymphs (young) are active from about March through much of the summer. During this period they molt seven to ten times, and are reddish-brown to black in color, except in the first stage when they are pale tan. The older brown Oriental cockroach nymphs are very difficult to distinguish from the American cockroach nymphs. In early spring, only adult Oriental cockroaches are found. By late spring, nymphs are abundant. As nymphal numbers increase, the adults die off and by August any adults are new ones. By fall, almost the entire population is adult. Inside they can be found in damp areas such as basements, crawl spaces, and kitchens, indoors and outside. They are usually found at or below ground level in yards, beneath leaves, in dumps, in the mulch of flowerbeds and in high moisture situations such as sewers, drains and dark, damp basements. They favor crawl spaces, spaces between the soil and building foundations, the undersides of stoops and sidewalks, landscaping mulches, water meters, basements and their floor drains, and other such moist places. 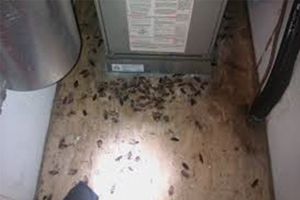 These cockroaches frequently live in floor drains that drain directly outside; these drains are also used as entrances to homes. They tolerate lower temperature ranges than other roaches and May winter in rock walls or such protected sites. During times of drought there may be movement towards the inside of the home, but generally speaking they are found outdoors during the warmer months. They may also move inside if it is unseasonably cold. Signs of cockroaches are their oothecae, which are “egg cases”. 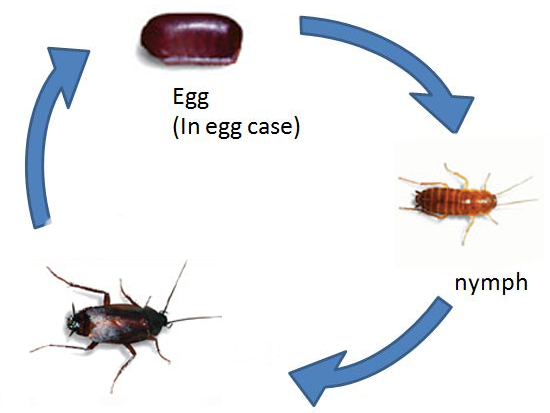 The blackish brown oothecae of the oriental cockroach are 10–12 mm (0.39–0.47 in) long, with indistinct egg compartments housing 16–18 eggs. These oothecae are formed a day after mating, and typically deposited a day or two after formation, though it can be deposited up to 7 days later. It is typically deposited in a sheltered area or attached to a substrate by oral secretion. They are initially a yellow white, turning reddish brown then blackish brown. They lose viability at temperatures below 0 °C (32 °F). They hatch on their own in about 42 days at 29.5 °C (85.1 °F) and 81 days at 21 °C (70 °F). Nymphs go through seven molts before becoming adults, which takes approximately one year. An adult Blatta orientalis can live from 34 to 180 days, and pairing takes place at any season. Egg case (ootheca) and early instars nymph of the oriental cockroach.